The number of American adults identifying themselves as Christians has declined. 86% of American adults identified as Christians in 1990 and 76% in 2008. 34% of American adults considered themselves “Born Again or Evangelical Christians” in 2008. The Catholic population of the United States has shifted away from the Northeast and towards the Southwest. Between 1990 and 2008, the Catholic population proportion of the New England states fell from 50% to 36% and in New York it fell from 44% to 37%, while it rose in California from 29% to 37% and in Texas from 23% to 32%. The percentage of Americans claiming no religion has increased. The percentage jumped from 8.2% in 1990 to 14.2% in 2001, and has increased to 15% in 2008. Northern New England has now taken over from the Pacific Northwest as the least religious section of the country, with Vermont leading all other states by a full 9 points. Changes in religious self-identification since 2001 have been moderate in comparison to the 1990s, which was a period of significant shifts in the religious composition of the United States. You can read highlights of the ARIS 2008 Survey here or download a pdf of the full report here. Albert Mohler offers some good commentary on the data with his post: Faith as Fashion Statement — The New Religious Reality? Update: Stephen Prothero questions the survey’s findings. Albert Mohler responds. 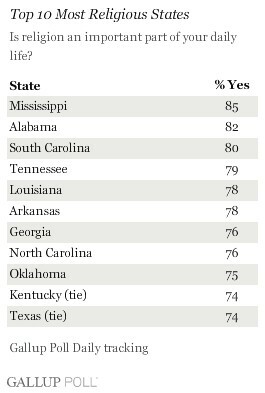 A new Gallup poll reports on the most and least religious states in the U.S. I found this especially interesting since I pastor a church in Massachusetts (which tied for third as the least religious state in the nation). Gallup used the responses to a straightforward question that asked: “Is religion an important part of your daily life?” Here are the breakdowns for the top ten most and least religious states in the country. 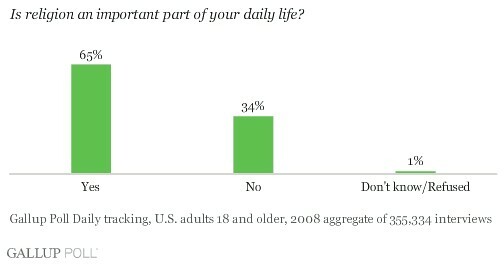 According to the poll, overall, 65% of Americans say religion is an important part of their daily lives. I am participating in the 30 Days of Prayer for the Muslim World. Here is today’s entry on the Hui people in Beijing. There are about 12 million Hui in all of China. The Hui people trace their ancestors back to Muslim traders, soldiers, and officials who came to China during the seventh through fourteenth centuries. These men settled and married local native (Han) Chinese women. The Hui have so well assimilated into the Chinese society that they are almost indistinguishable from the Han Chinese, except in dietary and religious practices. 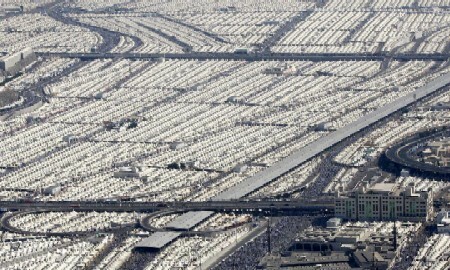 There is very little if any Christian witness to the Hui Muslims in general. There are no known believers among the Muslim Hui in Beijing. Beijing is the capital of the People’s Republic of China, The city was founded more than 3,000 years ago, and was regarded as the capital of China for over 850 years. May God open doors for Chinese believers in the Messiah to proclaim Christ to Muslims. May God cause the Muslim Hui people in the Beijing area to seek the true God. Pray that Chinese believers can be agents of blessing and positive change for the city and the Muslim population. If you would like to participate in the 30 Days of Prayer, you can click here for daily prayer summaries via e-mail or click here to subscribe to the 30 Days RSS feed. Pew Forum Religion Survey Skewed? The results leaped into national headlines, with 70 percent of those affiliated with a religion or denomination saying that many religions can bring eternal salvation … But there’s the rub. It’s impossible, based on a straightforward reading of the Pew Forum research, to know how individual participants defined the word “religion” when they answered. There is no way — based on this round of research — to know precisely how many believers have decided to reject what their faiths teach, if those faiths make exclusive truth claims about salvation and eternal life. Thus, said Smith, the Pew Forum is planning follow-up work. Click for Map of the World’s Religions.